Follow the rest of the afternoon's Premier League action here. Tottenham manager Mauricio Pochettino speaking to Match of the Day: "I am so pleased. Football is about the squad, the collective, of course we had some injuries after Manchester City like Alli and Kane and we were forced to make changes and we needed to provide fresh legs and it's good because we have a tough period ahead and the performance was very professional. "It's always important to open the game and score in the first half to give belief and confidence, after a few minutes we score the second goal and lift the stadium and fans - it's fantastic to play here and gives the players fantastic energy and belief." Huddersfield manager Jan Siewart speaking to Match of the Day: "Four goals are too much today, that doesn't reflect how we played. They have a crucial possibility to punish you but the result doesn't represent the way we played today. Tottenham's Victor Wanyama speaking to Match of the Day: "I think today we started well and everyone was on to it and I'm glad we got the maximum points. It was important to get that fast goal to break them down, once we got that they were more open and we got our chances. I'm going to enjoy it, it's a special goal for me. "Lucas has been fantastic, whenever he gets chances he tries to help the team. Everyone expected us to win but these games are very dangerous and we need to be focused. The team today was very organised and we tried to focus on our task and we did that well"
Sherbert: A little less conversation, a little MOURAction. Michael Povey: I think you mean excellent punditry Matt. Spurs are looking good. All they can do is win their games and I have a feeling they will be in the top four at the end of the season. 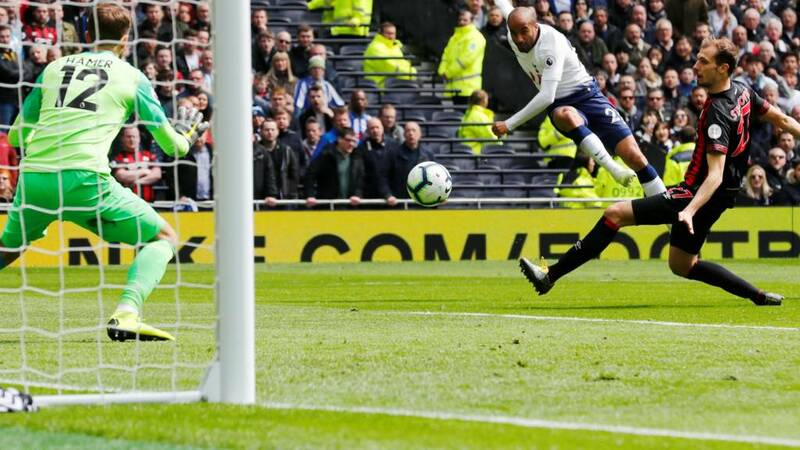 Nick H: When you dance down the pitch with a ball at your feet That's a Moura. Apologies to Dean. You lot have sent multiple variations on the Dean Martin classic. Tottenham's Lucas Moura speaking to Sky Sports: "That's my job, to help my team and score some goals because a striker needs to score. I practise all the time and I'm so happy today because I did very well, good passes, good finishes and if we play like this as a team we can win a lot of things. "Now we have a good battle in Manchester, we need from now to recover for this game and prepare very well. It will be so hard there but if we play like we did today we can go there and get a good result and we can qualify." This was the lovely moment at the end. Lucas Moura celebrating his hat-trick with one-year-old son Miguel. I asked: Lucas Moura is the fourth Brazilian to net a Premier League hat-trick. Mark: Sure Moura wanted four, but three is Moura less what he deserved. Lucas Moura is the fourth Brazilian to net a Premier League hat-trick? Four shots, three goals for Moura. Anyone come up with a better pun than David's 'That's Moura like it'? David Randall: That’s Moura like it.